Credit unions are re-appearing in Ukraine thanks to the determination of dedicated leaders like Raisa Volik. Mrs. Volik is aided in her efforts by a development project of the Canadian Co-operative Association, the Council of Ukrainian Credit Un-ions of Canada and the Canadian International Development Agency. It was the fragrance she remembered – the sweet smells of crops and earth, remembered from childhood days when she took dinner to the fields on the large collective farm where her father worked. 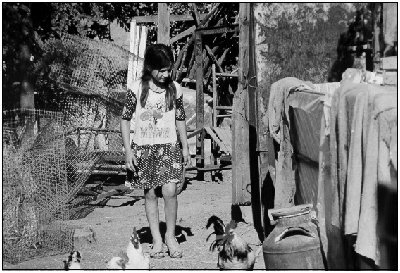 That memory stayed with her during her years as a city journalist, and it was still there, motivating her, when she chose to return to the land to scratch a living from a modest rented farm. The other motivation was Ukrainian independence. Suddenly, life as an independent farmer was a real possibility, not just an idle dream. She and her husband Oleksander bought a rural lot, built a small house, and rented 2.5 hectares of land near Izmail on the Danube river. Raisa threw herself into farming with her usual boundless energy. She soon realized that to survive, the farmers of the region would need to work together and in typical fashion she applied her considerable organizational talents to the task. Today, Raisa Volik is chairman of the Prydunavya Credit Union, one of 135 that, with the assistance of the Canadian Co-operative Association, the Council of Canadian Ukrainian Credit Unions, and the Canadian International Development Agency, is reintroducing the credit union concept to Ukraine. Not content with just one organization, she is also a founding member of the Association of Farmers of Ukraine (Izmail Region), and a nine-member agricultural service co-operative designed to share expensive equipment among small farmers. "As a young person, I liked to organize," she says. "I have always known that in order to change something or to accomplish something, you have to get involved, that you have to organize. That is why we started a credit union." Formed in February of 1999, the credit union is already a catalyst for farmers in the region. Farmers meet there, and young and old alike have been introduced to the world of computers – and co-operative concepts – through the credit union’s single machine. Though the credit union’s assets have reached just $2700 they are growing – enough for farmers to take out small loans for seed or fertilizer or fuel. Even this modest success has been hard won. Raisa says the biggest obstacle was the psychology of the peasants. "I found that the collective farm psychology from the communist era had created in the people a deep lack of faith or belief in one another, a feeling that everything around us belongs to no one, that someone else is going to take care of you." 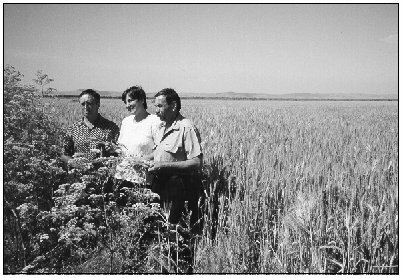 chats with two private farmers in a wheat field near the Danube River. Raisa’s daughter contributes to the family farm by tending to everyday chores. "People still long for the past, for the days when the prices of sausage and vodka didn’t change. Even though there were positive things in the past, I do not want to return to the times of communism. We have seen something different and I think that we should continue with this new path. Now people own their greenhouses and are producing many and more different products. In every epoch, there are challenges, but we have seen what was, and we see what we have now. We can make the choice." "Others want things to improve quickly. They say there is no work. But I say there is work to be done. We have to keep improving all the time. Independence means that you have the right to decide what you want to do – and then to do it." That attitude, backed by hard work and talent, has made Raisa, now 40, a respected leader, not only in the credit union, but in her community as well. "I am impressed with the rapport that she has with the farmers, including the men," says CCA project officer Dennis Kowalsky who helps man-age the Ukrainian Credit Union Development Assistance Program (UCUDAP). "They respect her and listen to her because she is a credible leader." According to Dr. Vitaly Zinovchuk, president of the National Agricultural Co-operative Union of Ukraine, women are among those hardest hit by the changes in Ukraine, but they have also stepped forward in significant numbers to work together for a better future, particularly through the credit union movement. Former federal Agriculture Minister and Canadian Senator Eugene Whelan, a long-time supporter of the Ukraine agri-food sector, has volunteered his time to assist with agricultural development in Ukraine. He too has observed the important role that women are playing. "When you go into villages in the Ukraine it is the women who have the small land holdings, they take care of two or three cows, they raise geese and they sell butter." Mr. Whelan adds that the women also have the clearest ideas about what needs to be done at the political level for the country to move ahead. While Raisa has worked hard to give women a stronger voice, she is reluctant to single women out. "All members of the family – men, women, and children are active in the co-operative movement. All members of the family work very hard on the farming operation. It cannot be done without the contribution of the entire family." While hard work and good intentions are key elements in the success of any venture, alone they are often not enough. For Raisa and her colleagues at Prydunavya Credit Union, the missing pieces were provided by the UCUDAP program. Raisa and the accountant at the credit union have both received training at the UCUDAP-supported Credit Union Training Centre in Ukraine, gaining the skills to turn a great idea into a real success. On a clear fall day, Raisa watches her husband and two daughters, Tamara (16) and Valentina (11) harvest pumpkins and melons. She thinks back to independence day, August 24, 1991 and takes in a deep breath. The fragrance of the earth and growing things is no longer something cherished in memory. Now, it is the smell of optimism and the future.